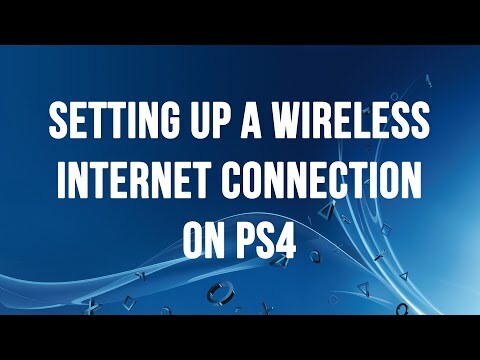 This article explains how to set up an internet connection on your PlayStation 4 system using either a wired or wireless connection. How do I set up a connection using a Wi-Fi (wireless connection)? You can connect to the Internet with the PlayStation 4 system using Wi-Fi (for a wireless connection) by going to [Network] > [Set Up Internet Connection] and selecting [Use Wi-Fi]. If you select [Easy], saved access points and access points that have been found appear. Select the access point you want to connect to, and then adjust the settings. Should the access point you want to connect to not appear, select [Set Up Manually], and then adjust the settings accordingly. When you are using an access point that supports WPS, AOSS or Rakuraku WLAN Start®, you can save that access point in just a few easy steps. AOSS and Rakuraku WLAN Start® are available only in certain countries and regions. If you would like to adjust your settings further, in case you are required to do so because of your network environment, you can select [Use Wi-Fi] > [Custom]. How do I set up a connection using a LAN cable (wired connection)? You can connect to the Internet with the PlayStation 4 system by using a LAN cable (for a wired connection) by going to [Network] > [Set Up Internet Connection] and selecting [Use a LAN Cable]. If you select [Easy] and follow the on-screen prompts, the standard settings are then automatically selected. Should you wish to adjust your settings further, in case you are required to do so because of your network environment, you can select [Custom]. How can my network environment impact my settings? Depending on the network environment you use, additional settings and items such as a proxy server, IP address, LAN cable or an access point might be necessary. For further information, refer to the information from your Internet service provider and the instructions supplied with the network device in use.